I recently posted a short piece about innovative merchandise. Here is a quick rundown on the different ways to sell your merch! Let me know what you think! SOUND IT OUT (75 mins) is a documentary portrait of the very last surviving vinyl record shop in Teesside, North East England. A cultural haven in one of the most deprived areas in the UK, SOUND IT OUT documents a place that is thriving against the odds and the local community that keeps it alive. The film is directed by Jeanie Finlay who grew up three miles from the shop, and represents a distinctive, funny and intimate film about men, the North and the irreplaceable role music plays in our lives. Sally Hodgson is the PMD on the project who I have written about before. 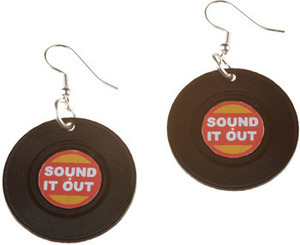 SOUND IT OUT also offers some more traditional fare including stickers, pin badges, and posters to go with more unique items like a pair of vinyl earrings custom designed by the wonderful people at Tatty Devine. I am a firm believer that in providing customers a way to engage your film at various price points – so that they can choose a level that feels right for them. This is common for crowdfund campaigns, but is only starting to be adopted by independents in their stores. 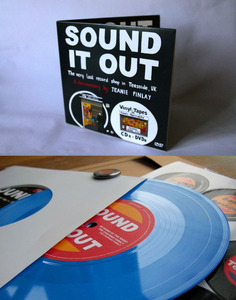 Sound It Out are selling various combinations of their merchandise. You can buy the ltd edition boutique vinyl DVD together with the classic DVD. There is also the “whole shebang” combo deal, which bundles together the Boutique DVD, A2 poster (paper), stickers and badges. Through their clever merchandising SOUND IT OUT shows that a little ingenuity goes a long way. By offering limited edition items in addition and combination with more traditional fare, SOUND IT OUT widens their net, creating unique value for unique consumers to ensure that no dollar is left on the table. Here is part 2 of PMD J.X. Carrera’s post on how he uses E-Junkie to distribute a film that he made while doing the actual fulfillment himself. I focused all of my efforts on Google Ads and dumped the rest. On Google Ads, I created several different ads, experimented with dozens of keywords, analyzed the results, and tweaked continuously over the course of a couple of weeks. I soon settled on the best performing ad and keyword combination that was bringing in a decent 1-2% click-thru-rate. On average, I pay about 40-60 cents every time someone does a google search and clicks on my text ad, which links them to my website. Purchase rate after click through hovers around 6%, and about a quarter to a third of the revenue generated from Google Ads is circled back into advertising on Google Ads. Many writers, such as Jed Riffe, have already done a great job articulating the how-to’s for listing a product on Amazon, so there’s not much need for me to dive into it. But it is worth mentioning that the revenue generated from my DVD listing on Amazon is a fraction of the revenue generated from the sales on my website. All the Google Ads link to my website, not Amazon. Although I began focused on creating an automated business, I also desired to have my video tutorial stocked in a retail outlet, thinking that it would help me generate hoards of cash. Perhaps this desire also stemmed from a subconscious need to prove that my video tutorial was good enough to exist in an established brick-and-mortar outlet — not the best motivation. I approached one of the buyers for a large retail outlet based in New York City, and sure enough they bought a box load of DVDs from me at $19.50 each. At the time, I found this to be extremely gratifying. Then I noticed an odd occurrence, which was the sales generated from my website took an unexplained dip. Upon investigating, I found that this retail outlet was selling my tutorial through their own online website at a discounted price. People who had discovered Crash Course: Final Cut Pro were now buying it cheaper elsewhere, which means I was being undercut and making less money than before. After that, I significantly decreased my tutorial’s retail presence. Sometimes, there’s value in being the exclusive or semi-exclusive seller of a niche product. An aspiring editor or filmmaker google searches the phrase “final cut pro tutorial,” they see my text ad, click it, and go to my website. If they buy the tutorial as a download, the money gets deposited in my Paypal account and E-junkie sends the buyer a link to download the Quicktime file. If they buy a DVD instead, Paypal sends me a notice that I have to package and mail out a DVD. My Google Adsense account is linked to my Paypal account, so revenue made from the tutorial pays for the advertising. Whenever Google Ads runs low on money, it just charges my Paypal account automatically. As I write this post, everything sounds a bit too easy. The truth is, setting up things like Amazon, E-junkie, and Google Adsense may be time consuming, but not actually difficult in terms of brain power needed. Creating good content, however, is usually both time consuming and mentally intensive. By far the hardest part of my automated business was the actual creation of the tutorial. Curating information and trying to figure out how to best teach an idea simply and effectively is painstaking. It makes me think of the quote by Mark Twain: “I didn’t have time to write a short letter, so I wrote a long one instead.” But I wanted a hard-hitting tutorial that editors would recommend to their friends and that I could be proud of creating. I also took the time to make sure the copy, design, and functionality of my website portrayed a sense of professionalism that would allow customers to feel safe and secure when purchasing from me. In the end, all the hard work paid off: I’ve sold hundreds of DVDs and downloads, and have received incredibly positive feedback from customers. I started Crash Course: Final Cut Pro with two humble goals: 1) that I would be able to wake up every morning, walk over to my computer, and see money deposited in my Paypal account because someone had purchased a tutorial while I slept, and 2) that I would add genuine value to the filmmaking community by helping to train aspiring editors, giving them a learning tool that I wish I had while first learning Final Cut Pro. What really makes Crash Course: Final Cut Pro unique, however, isn’t just the content, but its immediate availability as a DRM free download. Creating and selling a Quicktime file is a lot easier than creating and selling a DVD, yet many filmmakers seem to be reluctant to make their movies available as a download. I believe this stems from an overblown fear of piracy. As far as the indie world is concerned, I believe you’re losing money by not offering your video as a download. There have been many times where I would have purchased a movie instantly had it been available as a download, but since it wasn’t, I moved on to viewing something else. Briefly stated, people want to watch video in the format of their choosing, and with services like E-junkie, it’s now incredibly easy for filmmakers to quench this desire. We’ve been exploring alternatives to fulfillment for filmmakers in the last month or two. Many filmmakers are actually doing self fulfillment when their numbers are low – and using a shopping cart such as E-Junkie. J.X. Carrera is a PMD who specializes in online media and international entertainment, particularly in regards to China and Japan. He offered to write up how he uses E-Junkie to distribute a film that he made while doing the actual fulfillment himself. In this walkthrough, I’m going to break down how to create a simple automated business in which you are selling a video in the form of a download or a DVD from your own exclusive website to a niche market. For illustrative purposes, I’ll be using my own product and automated business – a video tutorial called Crash Course: Final Cut Pro that I sell from papersamurai.net – as a case study. Although the product is a video tutorial, the same DIY process would be applied to narratives, docs, books, music, software, and much more. I’ll also be discussing my decision to distribute downloads through the use of E-junkie in finer detail, since the opportunity for filmmakers to sell their movies as downloads (.avi, Quicktime) is often overlooked. The niche market I chose was the Final Cut Pro tutorial market. Despite there being an abundance of tutorials already in existence, I strongly felt there was an unmet need for a high-caliber Final Cut Pro tutorial for beginners. Most FCP tutorials touted being 5-6 hours long, which I felt didn’t appeal to the newbies who just wanted a comprehensive crash course that would allow them to “jump right into the game.” It took several weeks for me to script, screen capture, and edit my tutorial, and I did it all with just my laptop and a good external microphone. The only software I used was Final Cut Pro, DVD Studio Pro, and ScreenFlow, a fantastic screen capturing software. I paid a web designer/graphic artist $800 to work side-by-side with me in building a website using Drupal, as well as design a logo and DVD cover. I knew I wanted to offer my customers the choice of buying the tutorial as either a DVD for $39, or a download for $29, but I wasn’t sure how to handle the digital delivery. After researching all the services available I decided E-junkie was the best choice to handle my needs. E-junkie provided me with buy buttons and a shopping cart that integrated seamlessly with both my website and Paypal, as well as automated the secure delivery of my downloadable video file. With E-junkie, when a customer purchases a download from my site, a download link is emailed to him or her. One of my initial concerns about this was that the download link could easily be forwarded to other people or posted on a forum. To E-junkie’s credit, their service is highly customizable, and I could limit how many times the download link could be accessed before expiring. I knew a 500 MB file would be difficult for customers with slow bandwidth to download, and if I didn’t allow for multiple download attempts per link, I would be inundated with angry emails. So I decided to set the limit for the number of attempted downloads to 5. If the customer failed to download the file after 5 attempts, they would have to email me directly for assistance, at which point I’d hop on the E-junkie interface and email them a new download link with no questions asked. I also use E-junkie to handle the payment for the DVD version of my tutorial. This is the one part of my tutorial business that is not automated but easily could be. Instead of paying a fulfillment service to pack and ship the DVDs for me, I have no problem just dropping DVDs in the mail whenever I go to return my latest Netflix. In terms of sales, the majority of my business comes from downloads, which outnumber DVD purchases 3-1. I make a few more dollars with the DVD than I do the download, however, so I would never eliminate the DVD option.